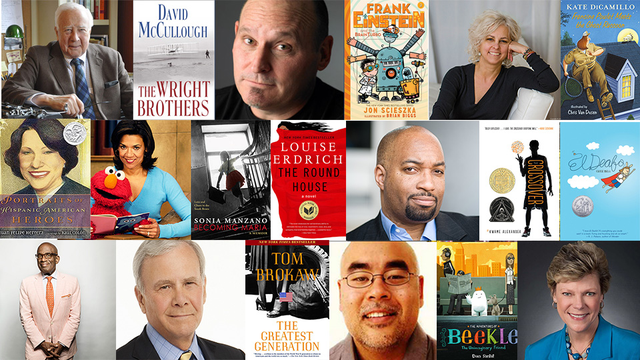 As dozens of bestselling authors and thousands of book fans converge on Washington, DC this Labor Day weekend for the 15th Annual Library of Congress National Book Festival, PBS Book View Now will be there to provide audiences nationwide with comprehensive coverage of the all-day literary event. Coverage will be produced by Detroit Public Television (DPTV) and is made possible thanks to the support of the Wyncote Foundation. The coverage will be hosted by Jeffrey Brown, Senior Correspondent and Chief Arts Correspondent for PBS NewsHour, and Book View Now host Rich Fahle. Jon Scieszka is one of our guest hosts — and someone who has dedicated his writing life to getting young kids excited about writing — and especially boys, a greater percentage of whom tend to drift away from reading after picture books. Scieszka is perhaps best known for his Stinky Cheese Man book with Lane Smith, but his Trucktown series are aimed at pre-K to Kindergartners. Kwame Alexander is a poet, educator, and New York Times Bestselling author of 21 books, including THE CROSSOVER, which received: the 2015 John Newbery Medal for the Most Distinguished Contribution to American literature for Children, the Coretta Scott King Author Award Honor, The NCTE Charlotte Huck Honor, the Lee Bennett Hopkins Poetry Award, and the Passaic Poetry Prize. His other works include the award-winning children’s picture book "Acoustic Rooster and His Barnyard Band," recently optioned as a children’s television show, and the Junior Library Selection, "He Said She Said," a YA novel.